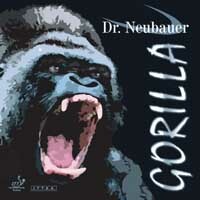 Dr. Neubauer GORILLA is our answer to the banning of frictionless long pimples. It is the perfect choice for all players who have previously used our 'Super Block', 'Inferno' or 'Scalpel' rubbers. This revolutionary Anti-Topspin rubber enables a highly effective blocking game, even against strong topspin shots. GORILLA offers a decisive disruptive effect because the ball can be returned either short or long over the net. In both cases the ball tends to stay low after the bounce, which makes it extremely hard for an opponent to keep on looping the ball. The good control of the rubber makes for easy returning of services, either passively or aggressively. GORILLA is perfect too for a versatile game using aggressive pushing and lifting, whether against chopped or counter-attacked balls. GORILLA also provides remarkably good playing characteristics when chopping. Strong topspin shots can be returned with enhanced backspin. The best disruptive effect is created when using it with 0.6mm sponge. Choose GORILLA and be surprised and fascinated by the good control and highly disruptive effect!